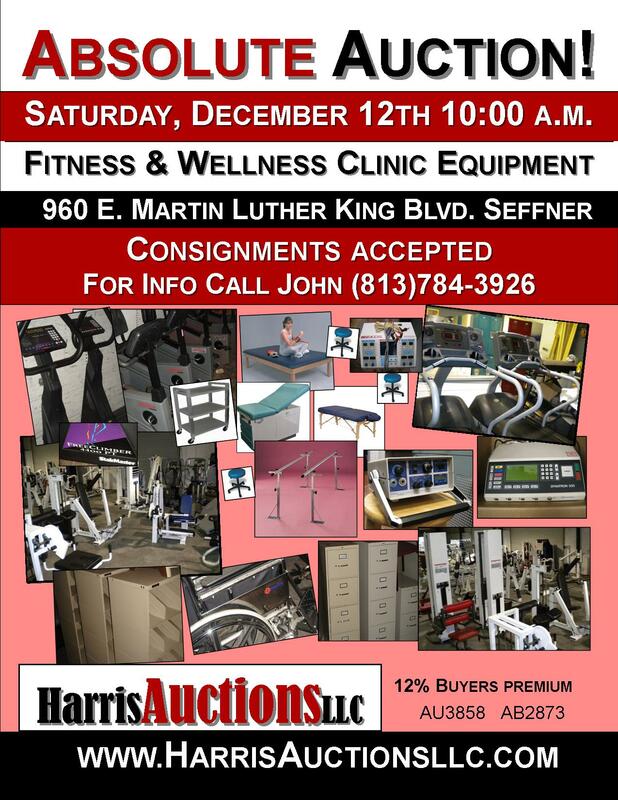 Saturday in Seffner-- Fitness equipment auction. Click here for more info. Saturday in Riverview, FL-- Pawn Shop Absolute Auction! Gold, silver, coins, tools, electronics, and a Harley Davidson Motorcycle. Click here for more info. Saturday in Sarasota, FL-- 1978 Cary Marine 50 Express will be sold at Sarasota auction. This magnificent craft will be sold to the highest bidder! Click here for more info. Preview the day prior Friday December 11th 12:00 to 5:00. Fitness & Wellness Clinic Absolute Auction! !Consignments Accepted.